Joseph B. Thomas, Sr. was born in Boston in 1848 and accumulated a fortune in the sugar business. The energetic mogul moved his family to New York where his athletic interests were reflected in his memberships in the New York Yacht Club, the Sewanhaka-Corinthian Yacht Club and his presidency of the St. Andrew’s Golf Club. Thomas would pass his love of outdoor sports to his son, Joseph B. Thomas, Jr. The younger Thomas would also inherit his parents’ sense of humor. In 1901, during the flurry of December debutante balls and teas, the society pages were filled with events in honor of young girls being introduced to society. And then there was the one mention of a man. Young Thomas would graduate in 1903, but before then he already was noticed as an expert polo player, champion hurdler and a breeder of Borzoi dogs – known as the “royal dog of Russia.” Because he was convinced that the best of the species had never left Russia, one of the first things on his agenda upon graduation was a trip to Russia. There he visited all the famous kennels, finally spending some time as a guest of the Grand Duke Nicholas at Perchina. The duke owned superior dogs and Thomas purchased Bristri, who would go on to become champion in the United States. Thomas’s parents were living in the exclusive Hotel Savoy when, in July 1909, Joseph B. Thomas, Sr. became ill with sarcoma. Three weeks later in August, he died. The younger Thomas began looking for an appropriate home for himself and his widowed mother. 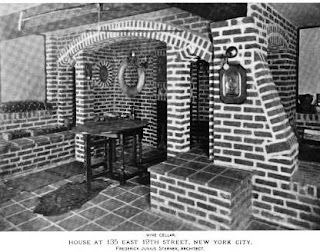 In the meantime, the innovative English-born architect Frederick Junius Sterner had come to New York from Colorado in 1906. He purchased a home on East 19th Street where nearly identical Greek Revival residences lined the block. Built half a century earlier, they were decidedly out of style. Sterner remodeled his home by slathering it with colored stucco, adding a Mediterranean-style red tile roof that extended beyond the façade, colorful tiles and decorative ironwork. The outmoded house was suddenly up-to-date and eye-catching. His work caught the eye of Joseph B. Thomas. 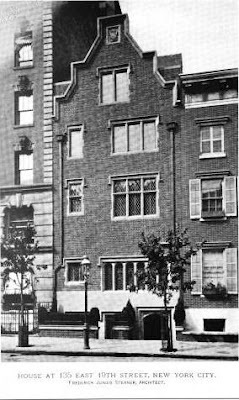 By the end of 1910 Sterner had reworked a rowhouse for Thomas, just down the street from his own, at No. 135 East 19th Street. For this project the architect transformed the mid-19th century house into a Gothic fantasy. The stone first floor, actually entered below street level, supported four stories of multi-colored brick, laid in a modified Flemish bond pattern. Diamond-paned windows topped by flat-headed Gothic eyebrows, a stepped gable that harbored crouching gargoyles and a carved coat of arms carried out the Gothic motif. An elaborate row of stained glass windows behind carved tracery marked the dining room. Inside, no trace of the former Victorian house remained. 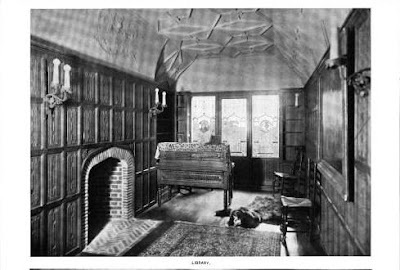 The living room, called “the Italian Room,” featured a barrel-vaulted ceiling with delicate plasterwork and an imposing stone fireplace. 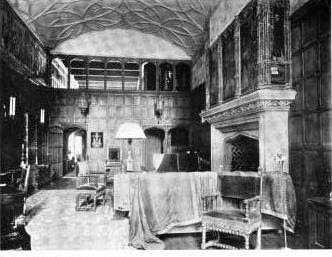 Carved paneling was used throughout to maintain the period illusion. The dining room was built as a balcony to the living room, opening onto it through a series of wooden arches. Below it all was an immense brick-and-tile wine cellar. Thomas’s love for fun and entertaining was evident in the many social functions in the house. On St. Patrick’s Day 1914 he hosted a dance and supper for which all the decorations and even the ices were green. The Balalaika Orchestra played Russian music (straying a bit from the Irish theme) and Miss Clara Fargo did several exhibition dances. 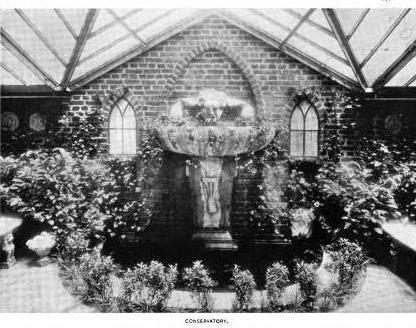 Later in 1914 the committee of the British War Relief Fund, supported by society dames like Mrs. W. K. Vanderbilt and Mrs. Arthur Burden, decided to give a fund-raising dance. They turned to Joseph B. Thomas and the event was held at No. 135 East 19th Street on December 16. A month later the announcement was made that surprised no one in New York society: Joseph Thomas was to marry Clara Fargo. The wedding took place on February 15, 1915 but was an understated affair due to the recent deaths of Clara’s grandfather and Joseph’s brother, Ralph H. Thomas. On July 28, 1916 Annie M. Thomas died at age 69. But joy was back in the house a year later in October when Clara and Joseph’s son, the new Joseph B. Thomas, Jr., was born. With the end of World War I Europe struggled to get back on its feet. Farms were destroyed by bombings and the population of farm animals had been decimated. Joseph Thomas became the New York State contracting agent for a program to ship American cows to Europe. It seemed like a nice thing to do. John T. Dooling, assistant District Attorney, protested the program, warning it “menaces the milk situation here.” Dooling felt that the several thousand cows being exported to France, Belgium and the Netherlands could result in American children having no milk to drink. The Thomases, however, continued with the fun-loving ways. On February 2, 1920 The Times reported on Clara’s participation in a fund-raising performance of Oscar Wilde’s “The Importance of Being Ernest,” in which society women played the female roles. “Mrs. Joseph B. Thomas, the former Clara Fargo, who was noted for her dancing, was Cecily Cardew and quite slim enough to be 17,” said the newspaper. The couple became close friends with artists Robert Chandler and George Bellows (who also lived in a Frederick Sterner-remodeled house on East 19th Street). Many of the homes along the 19th Street block had now been remodeled by Sterner and Joseph Thomas was passionate about the neighborhood. He planted plane and maple trees along the block and introduced the gingko tree here. For years he was president of the Gramercy Park Association. Finally, at 75 years old, Joseph B. Thomas died after a prolonged illness on July 14, 1955. The house at No. 135 was sold to advertising executive Robert B. Grady and his wife, Irma. 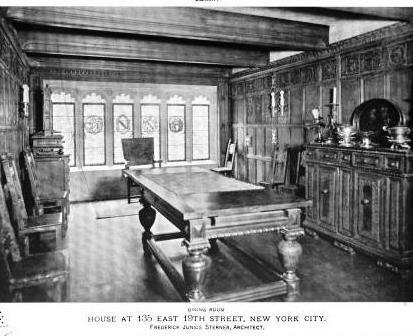 After fifteen years the house, called by The Times as “one of the most ornate in the area,” was sold to E. J. Smith with all the Grady furnishings intact. As the 20th century came to a close, designer Oleg Cassini owned the remarkable house. Today it remains unchanged—a once unremarkable house that was made truly remarkable in a 1910 make-over. I visited Oleg here. It was gorgeous. Thank you for this bit of history. I lived in this home with my parents, Robert Grady, and Irma Grady. The article misspelled my mothers first name. Thank you for correcting the spelling. At Schwartzman: Vogue, 01june1924 issue, page 38. A picture of the very pretty Mrs. Joseph B. Thomas, formerly Miss Clara Fargo. Wearing a silver lace and white and silver brocade 18th century costume, for a fancy-dress party in New York. As one does. It says they winter in their New York home. As one does. Will have to snap a picture of the house this weekend. As one does. Thanks for a great site. As an interior designer I added Cassini's signature wallcoverings and draperies, slipcovers, table runner, et al in his fabrics to every room in this 5-story house. Then as head of Sweet & Co. Public Relations, I planned the Press Reception to launch the Oleg Cassini Collection for Birge Wallcoverings. Every decorating editor and hundreds of wallcoverings retailers attending this event--the first "commercial" event in his home. It was such a success that Cassini allowed Jovan Perfumes to launch his perfume collection there a few weeks later! So sad to read current happenings to this home. I hope happier days are ahead. /s/ Patricia Hart McMillan, author "Home Decorating For Dummies"